Help your guests keep all their kitchen essentials in the proper place. 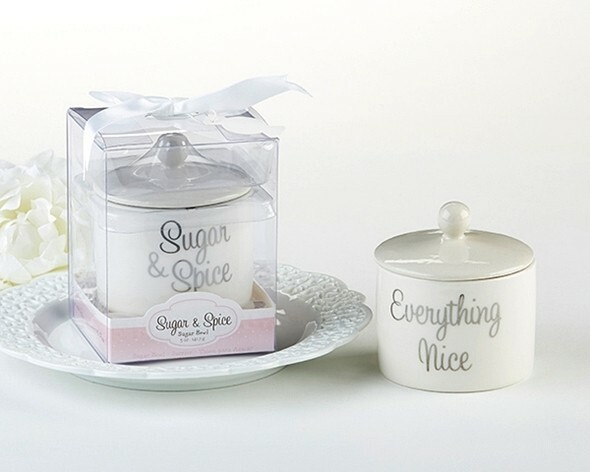 This ceramic sugar bowl will be great for when they are in the mood for something sweet. Personalized tags for these favors are available separately as Product Code: AK-31001NA-03-B. "I plan to keep ordering from your website. For whatever reason, I've been invited to 4 showers so far this year. At first I was worried and shopping around trying to figure out what to get each time. But the last two times, since I found your website, I've ordered a beautiful wedding favor from your website and I'm done. In like 3 minutes. You've made my wedding shower gift shopping a breeze. Thank you!" Carl G.